This classic pink and white single post bed with trundle is a piece that every 18 inch doll needs, and will be the perfect addition to your doll's collection! This Lovely single bed includes a roomy storage drawer for neatly organizing your doll clothes and accessories, which can be easily converted to a bed for sleepovers! 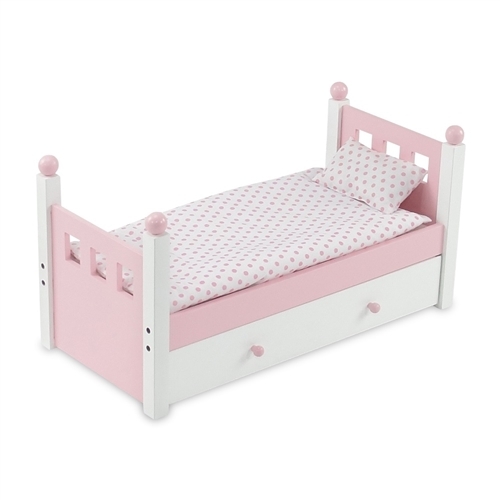 Sturdy and elegant this painted wood doll trundle bed comes with pretty pink and white polka dot bedding, including white mattress plus 2 comforters and 2 pillows! 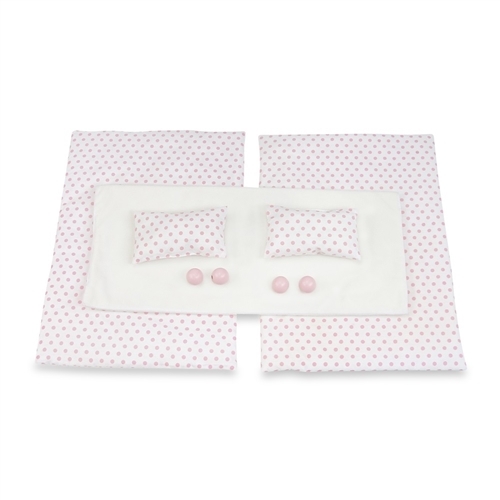 This sturdy and elegant pink and white painted wood doll trundle bed comes with super pretty pink and white polka dot bedding, including white mattress plus 2 comforters and 2 pillows! Lovely single bed includes roomy storage drawer for neatly organizing your doll clothes and accessories, which can be easily converted to a bed for sleepovers! Assembled product measures 23.5" x 11" x 11.75". Wooden doll furniture made to fit 14-18-inch dolls such as American Girl ®, Madame Alexander, Gotz, Journey Girl, Our Generation, etc. Designed and manufactured by Emily Rose Doll Clothes™. Doll furniture ships flat in brown packaging and requires easy assembly (instructions included). Dolls, doll clothing and bear are not included.